My father was born and raised in Nebraska. 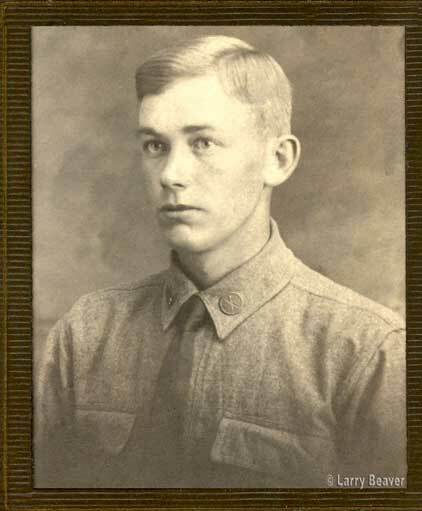 He moved to Wisconsin in 1917, I believe it was, and was married in 1919. I was born in 1926 and left Wisconsin in 1950. My father died in 1947 and my mother in 1978. I have one sister, who lives in Williams, AZ. When my mother died in 1978 my sister and I went through her private papers and we found a scroll, or certificate, which was rolled up and in poor condition. It was a certificate of honor from the French government for Private Henry Winter, Jr. who had died in the battle of the Argonne Forest on October 6, 1918. The scroll, or what you may call it, said that his name was put on a cenotaph somewhere. I have not located that. However, I was led to the Meuse-Argonne American Cemetery and learned the location of his grave. A Belgian lady living near the cemetery took photos of the grave for me. The American Battle Monuments Commission is in charge of the cemetery and needs to complete Henry’s record. They do not have a date of birth. Using Ancestry.com and other sources, I found a Henry Winter who was born in 1892. That would have made him 26 when he died. Except for the fact that that Henry Winter lived and died in Norfolk, Nebraska in 1975! Back to the drawing board. Using census records I found a few more Henry Winters and one of them seemed to fit. Born in April 1896, but no particular day given. Going on, I ran across the name Venus Winter, and him I knew several years ago. I learned he had a daughter living in Tucson and I contacted her via email. There was no answer for about two weeks and I wondered why, and then she wrote that the day after she got the email, she and a brother went to Nebraska for a family reunion. The name Henry Winter Jr. was asked about, but nobody knew of a Henry Jr. She was told, though, that there had been another Henry, son of Ferdinand Winter. When I read that name, I stopped in my tracks because I knew Ferdinand in the early ’40s. He had deserted his family in Nebraska and moved to Hayward, Wisconsin where he lived in the woods as a hermit. My dad and some other men had homesteaded some property in northern Wisconsin in the ’30s and built a small cabin on a small lake. We’d go there once or twice a year. And each time, we’d drive to Hayward to visit Ferdinand. But no women on the property!!! Nosireee! He hated women and my mother and sister and any other woman who might be with us had to stay in the car. In the early ’40s, Dad got a phone call one day from the Sawyer Countty Sheriff, saying that Ferdinand had been hit by a car and was killed. The sheriff asked Dad to come up there. Dad asked how he had gotten his name, and the sheriff said there were letters from dad he had found. Dad gave him the names and phone numbers of family in Nebraska; but he called back the next day and said that nobody there wanted anything to do with Ferdinand. So Dad and I went up there the week between Christmas and New Year. It was cold!! We went into his cabin to look for things, such as deeds, a will, and whatever else there might be. I don’t remember, but that must be how Dad and Mother got that certificate/scroll. I can think of no other way. But – who was Henry Winter Jr.? The lady in Tucson told me that she had gone through her father’s photo albums and other papers and found pictures of Henry in uniform. She is the one who told me he had been at Camp Cody. And she said there were several references to Junior! All referred to Henry. But why Junior? While looking at census records, I decided to look up my wife’s family. I found a census from 1930 listing her family. William Elbert Decatur Isley, father, Lola Mae, spouse. etc. There was a Minnie Isley. I had never heard of her – nor had my wife. Then my wife remembered that her oldest sister, Leona, had been called Minnie within the family. Then there was Chester, Cecil, Grace, Mary Lee (my wife), Phyllis – and Junior Isley! That brother’s name was J D. No names, just the initials J D. That’s what people called him, and he was known as Junior. Could it be because the name by which his father was commonly known as Dee Isley? So we had a Dee Isley – and a J D Isley. And Junior must have come out of that. I’ve become quite sure that the Henry Winter I’m looking for is the one born in April 1896. I’m still looking for a day. I’ve struck out with county birth records because Madison County, Nebraska, did not record births for some period of time. Why not, I don’t know. But I think I can find out through other means. Ferdinand Winter does not show up in census records with his family. I’ve learned that his wife became very ill and was in a mental hospital where she died. I’ve found a Henry Winter in a census record listed as being a grandson, and I have found Ferdinand listed in a record of Carl Winter’s family as being a brother. So it seems that Ferdinand moved in with family before skipping out to become a hermit in Wisconsin. There are no church records that I’ve been able to find. 1) Camp Cody cost American taxpayers $2,025,00 in 1917. 2) 10,000 loaves of bread were baked for the soldiers each day. 3) 30,000 men were stationed there for about a year and a half. 4) Camp had three main streets and 18 cross streets. 5) 1,200 mess houses to feed the men. 6) 1,200 or more showers bath houses. 7) Eleven enormous ware houses to store food, clothing and other necessities. 8) Five YMCA buildings and at least one YWCA building. 9) Sports arena with a seating capacity for 4,000 men with a 68-by-80-foot stage. 10) 6,000 tents – each was floored, framed and equipped for electricity. 11) A large remount station located at the northwest corner of the camp. 12) Camp Newspaper – “The Trench & Camp” was published from October 8, 1917 until December 5, 1918. 13) Large target range near Black Mountain, just northwest of Camp Cody. 14) Each Regiment had buildings for headquarters and a regimental exchange. 15) Each Brigade was provided with an office building. A devastating fire on July 12, 1973 at the “National Archives and Records Administration” in St. Louis destroyed about 80 percent of the records for Army personnel discharged between November 1, 1912, and January 1, 1960. Many of these records were of solders who served at Camp Cody during World War One. We know that about 30,000 soldiers were at Camp Cody in Deming, New Mexico from 1917 to 1918. A list of these names would be great to have. I get emails asking if a relative served at Camp Cody. I feel bad that I do not have this information. It would be great to write back with the answer. Sometimes just a small amount of information can help those who are working on their family genealogy. Many of the soldiers saved their “Thanksgiving Day Menu” with a roster of the men in their unit. If anyone has one of these rosters I would really appreciate a scan of it to add to my list of Camp Cody names. Scan a panoramic photo into your computer. From time to time I get questions about how to take a panoramic photo and scan it into the computer. Start by scanning in each part of the photo with at least 25% overlap. You also must be very careful to keep the photo straight as you move the photo after each scan. This will give you many scans with each scan showing you only a small part of your panoramic. Then you use a program such as PhotoShop CS or PhotoShop Elements to stitch each on of your scans into one large scan. These programs will now take over and do the work. After a short wait you will see the results of your efforts. If you did not overlap correctly these programs will not be able to complete the job and will ask for your help. Practice makes perfect. There is also a very good free program called “Autostitch” that does a great job putting photos together to make your panoramic. The “Options” default is set to only 10% of actual size and the JPG quality to only 75%, so check this before you are ready for your final result. See information below for the link to get this free program. Remember that practice makes perfect. Autostitch(TM) is world’s first fully automatic 2D image stitcher. This demo has been created to demonstrate the basic functionality of Autostitch. The user simply selects a set of images using the windows interface, and the software automatically stitches them into a panorama. This program has been tested under Windows XP/2000/98.